Zip line at night under the full moon! 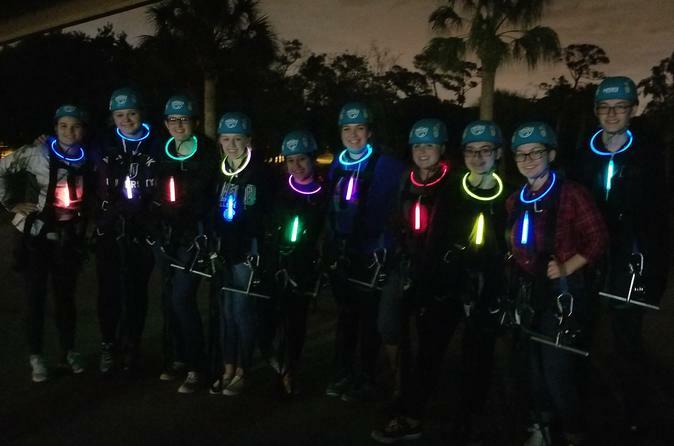 Our 2 hours guided moonlight zip tour will take you over 5 zip lines, and our 200ft suspension bridge all in the dark with only the light of the moon leading your way! See the beautiful city lights from a bird's eye view at the top of the bay! Guests will arrive 30 min prior to their tour start time to check in. After check-in, guests will gear up with the help of your guides and be given a glow stick. After getting into gear, we will climb up 60 ft and begin the fun! Your tour guides take care of all of your gear, safety transfers, and braking. They will lead the group through the course ensuring safety every step of the way. The zip lines range from 400-650ft, giving you over 3,000 feet of cable to zip on! You will also encounter the 200ft Flight of the Osprey bridge which will leade you to breathtaking views of Tampa Bay at night! After the tour, your guides will help you out of your gear. Come howl at the moon and fly through the night!